For rapid, bioluminescent luciferin/luciferase based assay for cell viability, proliferation, cytotoxcity and high-throughput screen for anticancer agents. • Sensitive and accurate. As low as 50 cells can be quantified. • Robust and amenable to HTS: Z’ factors of 0.6 to 0.7 are routinely observed in 96-well and 384-well plates. Can be readily automated on HTS liquid handling systems for processing thousands of samples per day. Adenosine 5’-triphosphate (ATP) is the chemical energy for cellular metabolism and is often referred to as “energy currency" of the cell. ATP is produced only in living cells during photosynthesis and cellular respiration and consumed in cellular processes including biosynthetic reactions, motility and cell division. It is a key indicator of cellular activity and has been utilized as a measure of cell viability and cytotoxicity in research and drug discovery. 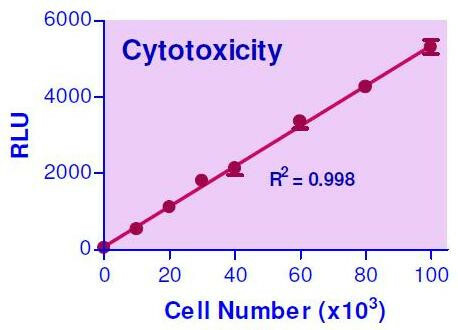 BioAssay Systems’ EnzyLight™ Cytotoxicity Assay Kit provides a rapid method to measure intracellular ATP, cell viability and cytotoxicity. The single working reagent lyses cells to release ATP, which, in the presence of luciferase, immediately reacts with the Substrate D-luciferin to produce light. The light intensity is a direct measure of intracellular ATP concentration and hence number of living cells. This non-radioactive, homogeneous cell-based assay can be conveniently performed in microplates. The reagent is compatible with all culture media and liquid handling systems for high-throughput screening applications in 96-well and 384-well plates. Applications For rapid, bioluminescent luciferin/luciferase based assay for cell viability, proliferation, cytotoxcity and high-throughput screen for anticancer agents. References Assay: Cytotoxicity in Mouse NIH-3T3 fibroblast cells (Pubmed). 1. Massa, SM et al (2010). Small molecule BDNF mimetics activate TrkB signaling and prevent neuronal degeneration in rodents. J Clin Invest 120(5):1774-85. Assay: Cytotoxicity in Mouse NIH-3T3 fibroblast cells (Pubmed).